Gene's Chrysler Dodge Jeep RAM features the latest manufacturer offers and incentives on all new Chrysler, Dodge, Jeep, and RAM vehicles. Discover which offers are best for you and drive off in a new car today. Be sure to check out our all-new inventory of FWD and all-weather vehicles including the Jeep Grand Cherokee, Jeep Patriot, Dodge Journey and the RAM trucks right here in Fairbanks, AK. We also carry an exciting selection of new Dodge sports cars and compact cars! If you’re in the market for a used car, Gene's Chrysler Dodge Jeep RAM stocks numerous makes, models, and styles. Our friendly sales staff will help navigate you through our pre-owned lot to find a car, truck, SUV, or minivan that suits your needs. We have inexpensive used vehicles that feel like new, and everything in between. Fairbanks shoppers can be sure, Gene's Chrysler Dodge Jeep RAM is the place to shop for used cars. Other convenient services offered at Gene's Chrysler Dodge Jeep RAM include low-interest financing and automotive servicing. After purchasing a new car or used car, Gene's Chrysler Dodge Jeep RAM will help you get a car loan you feel comfortable with. Whether drivers in Fairbanks purchase their vehicle at Gene's Chrysler Dodge Jeep RAM or somewhere else, our highly-trained mechanics will quickly service and repair your vehicle, getting you back on the road in no time. For a car buying event you will be more than satisfied with, come into Gene's Chrysler Dodge Jeep RAM your home for Fairbanks Chrysler, Dodge, Jeep and RAM vehicles. Have Your Eye on a New RAM, Jeep, Dodge or Chrysler? 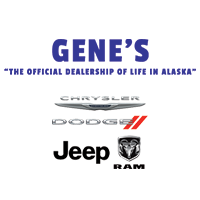 Gene's Chrysler Dodge Jeep RAM, Serving Fairbanks, North Pole and College is the Place to be! We certainly don’t blame you. The vibrant new RAM 1500, RAM 2500, Jeep Patriot, Dodge Journey and Chrysler 200 cars in our showroom serving drivers from Fairbanks, North Pole and College always bring style and performance to the table. In fact, with a wide-range of exciting RAM, Jeep, Dodge, Chrysler models available, it can be difficult to make a decision. That’s where Gene's Chrysler Dodge Jeep RAM comes in; we’re happy to review the details and answer any questions to help you discover the vehicle that best matches your lifestyle. What are some of the new RAM, Jeep, Dodge and Chrysler models you’ll find at Gene's Chrysler Dodge Jeep RAM? The RAM 1500, RAM 2500, Jeep Patriot, Dodge Journey and Chrysler 200, to name a few. As for which ones stand out among the pack: that’s up to you to decide. Here, it’s all about what suits you best. That’s why we encourage you to keep an open mind and evaluate all of your options – many of which, we’re proud to say, have earned at least one award or accolade. Of course, a new car might not be in the cards for everyone at this very moment. That’s why Gene's Chrysler Dodge Jeep RAM also makes sure to carry a wide range of used cars to choose from as well. Thoroughly inspected for quality and integrity, you can be sure that each one meets our incredibly high standards for excellence. Why should you expect anything less? Our team isn’t simply committed to helping you find your next car; we want to ensure you drive it home as well. That’s why Gene's Chrysler Dodge Jeep RAM staffs an onsite auto financing department. Simply put, we’re here to crunch the numbers, make calls and do everything else in our power to find a financing solution that works for you. All you have to do is sit back and picture your next RAM, Jeep, Dodge or Chrysler parked in your driveway. Gene's Chrysler Dodge Jeep RAM is also by your side whenever you need any car service and repair work done in Fairbanks. Even if you haven’t seen us before, we’re proudly serving drivers in the North Pole and College areas. What’s more, our auto parts team would be happy to get you whatever you need to keep your RAM, Jeep, Dodge or Chrysler vehicle on the road for many miles to come. Gene's Chrysler Dodge Jeep RAM doesn’t expect you to simply take our word that we offer excellent service, however. Sometimes, seeing truly is believing. That’s why we invite you to visit us at 3400 Cushman Street in Fairbanks, AK at your earliest convenience.